Our full sized chicken had a bulging crop for a few days. We got it to finally go down and the sour crop is almost gone. However, her neck is still swollen. When you feel it, it feels like a bone sticking out like this >. 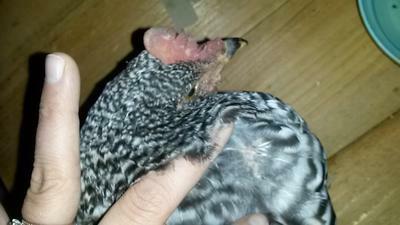 Could another chicken have fractured her neck bone? She still can move her head back and forth but is weak and stumbles a lot. Any help would be greatly appreciated. Thanks in advance! Thanks for sending photos. I wish I cold feel what you are feeling in this protrusion. Could you be feeling the keel bone? I know that is lower than the neck, and just below the crop area, but it protrudes like a v shape along the breast are of a chicken if they are under weight. I'm guessing that the sour crop has left her feeling ill. It's like us having a stomach flu, possibly worse. If this were my chicken I would have her on cage rest. She needs to be able to get up and move around, keep warm enough and she should be eating fresh greens, whole seeds, some fruits and veggies, things that will keep her crop emptying well, plus plenty of water, of course. Chickens were not designed to digest processed feeds, though processed chicken feeds have been designed to provide a fairly balanced diet for chickens. Unfortunately some chickens are little piggies and eat more than their crop can process in a normal amount time. This can lead to sour crop. 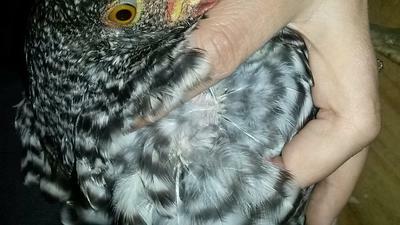 During an episode with sour crop, a chicken is not getting much nourishment and can get weak and thin. Often anything leaving the crop and going through the digestive system is somewhat toxic. It may take her a while to recover from this. I would suggest that pellets or crumbles only make up half her diet until she is acting normal again, and give her a rationed portion for her weight. Raw apple cider vinegar in her water and some probiotics or live culture yogurt in her diet will help restore good crop and gut bacteria and live digestive enzymes. Like I said, wish I could feel the protrusion you have described. I would suggest keeping her away from the flock. A sick chicken will get the attention of predators from the air or the ground, which will put the rest of the flock in danger, too.